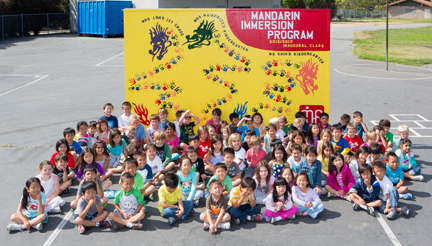 What will be the qualification of a Mandarin Immersion Program (MIP) teacher? California multiple subject credential with a Bilingual Authorization in Mandarin BCLAD/BAMA. Do I need to speak Mandarin Chinese? No, the program was designed for children of families who do not speak the Mandarin, and also for families whose native language is not English. For families who don’t speak Mandarin at home, additional effort will need to be made to bring that language and culture into their homes; language is not just acquired at school. We hope to provide support through a variety of sources including after school programs local and private libraries and other Friends of MIP families. 1. Traditional characters carry more of Chinese history, culture, and essence of each word. 2. It’s very easy to read simplified after learning traditional. characters in use vs over 100,000 (although 8,000 are in regular use) traditional characters. Do you teach Mandarin phonetics (ZhuYin) or Pin Yin(English characters)? Along with traditional Chinese characters, Mandarin phonetics (Zhu Yin) will be taught as a fundamental building block which could be conceptually transferred to English phonetics. The Pin-Yin (English characters) will be taught in the upper grades. Since the Mandarin Immersion program is not a program at a Title 1 School, the same ratios of regular kindergarten classes would apply. If extra funds are raised (other than District funds), the ratio can be lowered via Teacher Aides. If there is an overwhelming interest from parents for the class how will children be selected to attend? A lottery system or is it based upon who signed up on the “interest list” first? Would children who live in the district have priority over children who do not? A lottery system will take place. A series of mandatory parent meetings will take place to ensure only committed families are part of the process. Children who live in the district WILL have priority over out of district students.